Interstitial lung disease (ILD) is a heterogeneous group of disorder with a common presentation of cough (mostly dry), breathlessness and symptoms related to the systemic disorder when associated with. 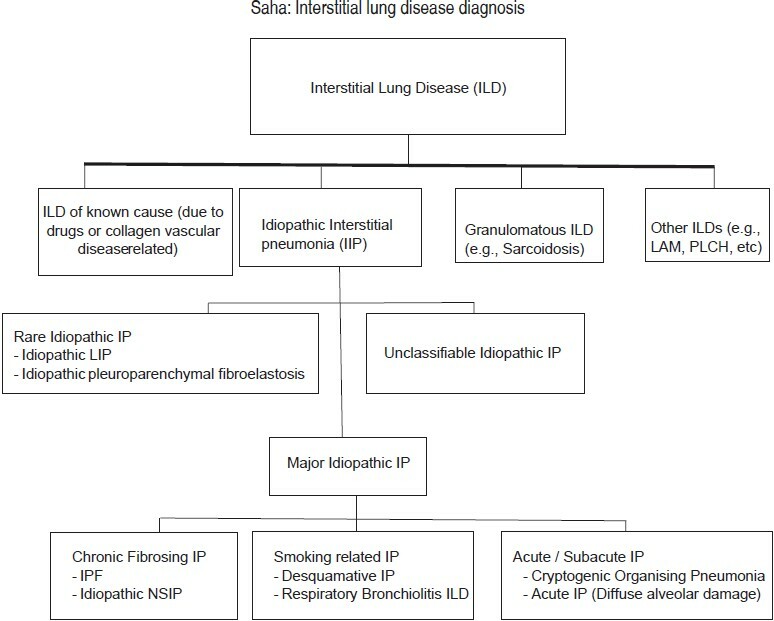 ILD is also termed as diffuse parenchymal lung disease (DPLD) and classified broadly into idiopathic interstitial pneumonia (IIP) and other than IIP [Figure 1]. , After an initial suspicion, a comprehensive evaluation requires the following: (1) A methodical history to include demographics, family history and occupational and environmental exposures [Table 1]; (2) physical examination [Table 1]; (3) chest radiographs; (4) high resolution computed tomographic (HRCT) scans; (5) blood tests; (6) fiber optic bronchoscopy (FOB) with bronchoalveolar lavage (BAL) or transbronchial lung biopsies (TBLB) in selected patients; (7) surgical lung biopsy (SLB) (selected patients). After confirmation or definite diagnosis of the type of ILD (also the causative factor if any), assessment of the severity and dynamics of the disease with and without therapy should be made. It is the most common symptom and on presentation it may be during exertion or at rest. ,, The degree of dyspnea should be assessed by asking specific questions such as after what distance or how many steps or stairs or floors the dyspnea occurs and how long it persists. Non-respiratory factors such as joint pains, muscle cramps or general body weakness must be excluded before assessing the degree of exercise limitation. The recent change in the degree of dyspnea should be assessed as it is linked with the disease severity and prognosis. , The rate of progression of disease is of equal importance as patients with IPF, PLCH and ILD associated with connective tissue disease (CTD) present with insidious onset of symptoms. Hemoptysis may indicate the presence of underlying diffuse alveolar hemorrhage (DAH) syndromes such as Goodpasture syndrome or Wegener disease and rarely due to SLE or pulmonary hemosiderosis or drugs/toxins. The absence of hemoptysis does not exclude DAH (especially chronic) or other underlying conditions that are associated with microscopic hemorrhage (e.g., SLE). Several extra pulmonary (gastrointestinal tract, rheumatologic, cutaneous, musculoskeletal, neurologic, renal) symptoms may provide useful clues. A diffusely abnormal chest radiograph is often the initial finding that alerts the physician to the possibility of ILD. The clinician should make every effort to obtain previous chest radiographs for review. This may allow one to ascertain the onset, chronicity, rate of progression, or stability of the patient's disease. Classification of abnormalities on routine chest radiograph that are based on distribution, location and overall appearance are useful in narrowing the differential diagnosis [Table 5]. ILDs are a heterogeneous group of parenchymal lung diseases that vary widely in etiology, pathogenesis, histopathology, clinicoradiologic presentation and clinical course. Diagnosis of these diseases is done by an organized formulation of the clinical evaluation, PFTs, tempo of the disease process and radiologic findings, as well as a selective use of laboratory investigations, serologic tests, echocardiography, bronchoscopy and SLB [Figure 2]. A lung biopsy specimen is required for correlation of histopathologic findings with the clinical context and radiologic findings. 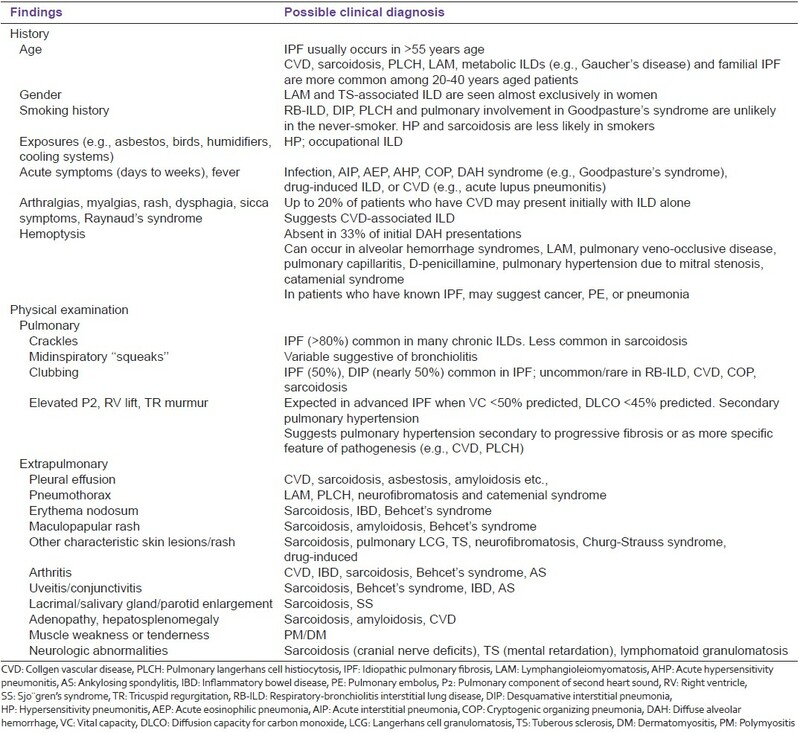 I summarize common types of ILD in [Table 9] for better understanding of those disorders. 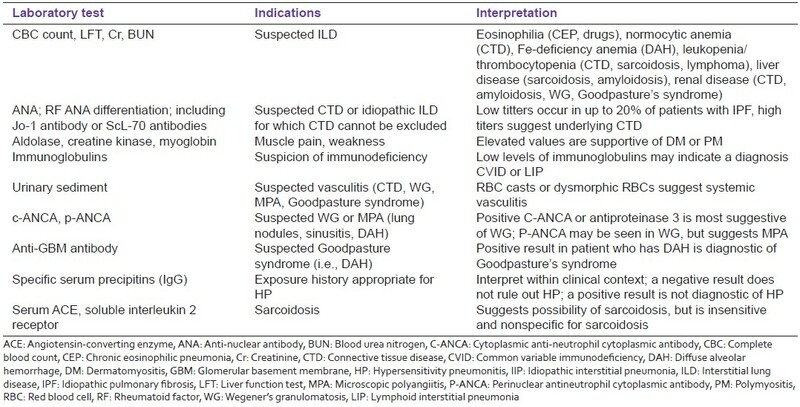 Understanding of these disorders is important to achieve a specific diagnosis to facilitate the optimal management for patients with ILDs. 1. American Thoracic Society, European Respiratory Society. American Thoracic Society/European Respiratory Society International Multidisciplinary Consensus Classification of the Idiopathic Interstitial Pneumonias. This joint statement of the American Thoracic Society (ATS), and the European Respiratory Society (ERS) was adopted by the ATS board of directors, June 2001 and by the ERS Executive Committee, June 2001. Am J Respir Crit Care Med 2002;165:277-304. 2. Travis WD, Costabel U, Hansell DM, King TE Jr, Lynch DA, Nicholson AG, et al. An official American Thoracic Society/European Respiratory Society statement: Update of the international multidisciplinary classification of the idiopathic interstitial pneumonias. Am J Respir Crit Care Med 2013;188:733-48. 3. Behr J. 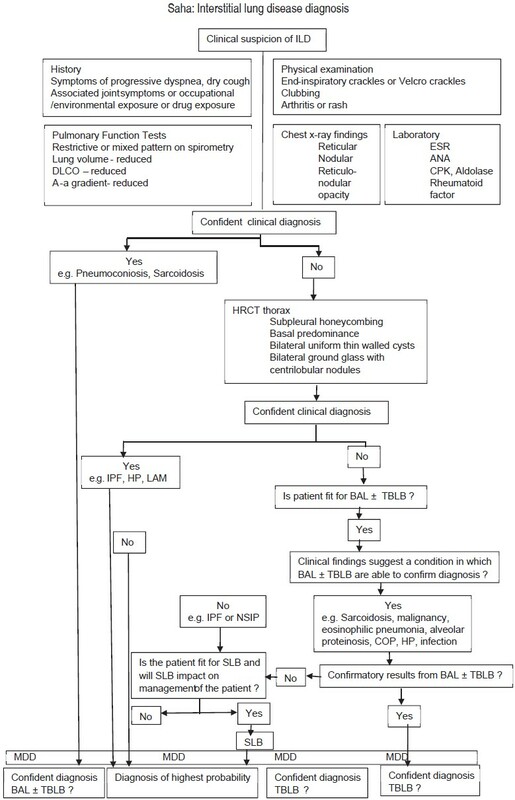 Approach to the diagnosis of interstitial lung disease. Clin Chest Med 2012;33:1-10. 4. Leslie KO. My approach to interstitial lung disease using clinical, radiological and histopathological patterns. J Clin Pathol 2009;62:387-401. 5. Yang S, Raghu G. Clinical evaluation. In: Costabel U, Dubois RM, Egan MM, editors. Diffuse Parenchymal Lung Disease. Basel, Switzerland: Karger; 2007. p. 22-8. 6. Ryu JH, Colby TV, Hartman TE, Vassallo R. Smoking-related interstitial lung diseases: A concise review. Eur Respir J 2001;17:122-32. 7. Grutters JC, du Bois RM. Genetics of fibrosing lung diseases. Eur Respir J 2005;25:915-27. 8. Garcia CK, Raghu G. Inherited interstitial lung disease. Clin Chest Med 2004;25:421-33, v.
9. Yang IV, Burch LH, Steele MP, Savov JD, Hollingsworth JW, McElvania-Tekippe E, et al. Gene expression profiling of familial and sporadic interstitial pneumonia. Am J Respir Crit Care Med 2007;175:45-54. 10. Müller NL, White DA, Jiang H, Gemma A. Diagnosis and management of drug-associated interstitial lung disease. Br J Cancer 2004;91 Suppl 2:S24-30. 11. Foucher P, Camus P, The GEPPI. The drug-induced lung diseases. Available from: http://www.pneumotox.com. [Last accessed on 2004 Jul 15]. 12. Lynch J III, Keane M. Treatment of parenchymal lung diseases. In: Spina D, Page CP, Metzger WJ, O'Connor BJ, editors. Drugs for the Treatment of Respiratory Diseases. Cambridge: Cambridge University Press; 2003. p. 247-335. 13. Lacasse Y, Selman M, Costabel U, Dalphin JC, Ando M, Morell F, et al. 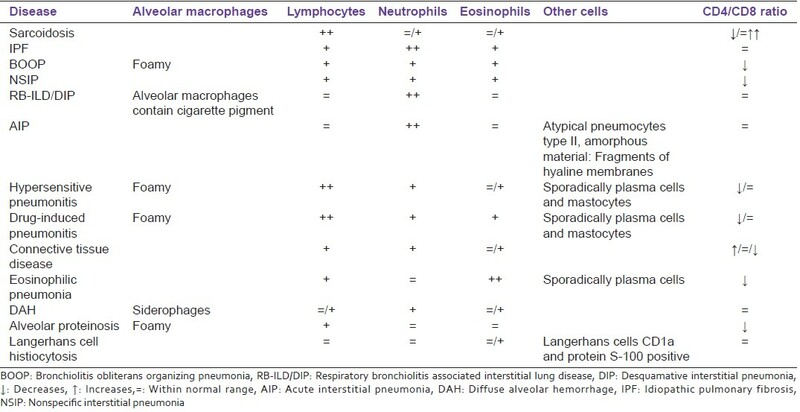 Clinical diagnosis of hypersensitivity pneumonitis. Am J Respir Crit Care Med 2003;168:952-8. 14. King TE Jr, Tooze JA, Schwarz MI, Brown KR, Cherniack RM. Predicting survival in idiopathic pulmonary fibrosis: Scoring system and survival model. Am J Respir Crit Care Med 2001;164:1171-81. 15. Gribbin J, Hubbard RB, Le Jeune I, Smith CJ, West J, Tata LJ. Incidence and mortality of idiopathic pulmonary fibrosis and sarcoidosis in the UK. Thorax 2006;61:980-5. 16. Raghu G, Freudenberger TD, Yang S, Curtis JR, Spada C, Hayes J, et al. High prevalence of abnormal acid gastro-oesophageal reflux in idiopathic pulmonary fibrosis. Eur Respir J 2006;27:136-42. 17. Bradley B, Branley HM, Egan JJ, Greaves MS, Hansell DM, Harrison NK, et al. Interstitial lung disease guideline: The British Thoracic Society in collaboration with the Thoracic Society of Australia and New Zealand and the Irish Thoracic Society. Thorax 2008;63 Suppl 5:v1-58. 18. Flaherty KR, King TE Jr, Raghu G, Lynch JP 3 rd , Colby TV, Travis WD, et al. Idiopathic interstitial pneumonia: What is the effect of a multidisciplinary approach to diagnosis? Am J Respir Crit Care Med 2004;170:904-10. 19. Vij R, Strek ME. Diagnosis and treatment of connective tissue disease-associated interstitial lung disease. Chest 2013;143:814-24. 20. Martinez FJ. Idiopathic interstitial pneumonias: Usual interstitial pneumonia versus nonspecific interstitial pneumonia. Proc Am Thorac Soc 2006;3:81-95. 21. Lama VN, Flaherty KR, Toews GB, Colby TV, Travis WD, Long Q, et al. Prognostic value of desaturation during a 6-minute walk test in idiopathic interstitial pneumonia. Am J Respir Crit Care Med 2003;168:1084-90. 22. Eaton T, Young P, Milne D, Wells AU. Six-minute walk, maximal exercise tests: Reproducibility in fibrotic interstitial pneumonia. Am J Respir Crit Care Med 2005;171:1150-7. 23. Sumikawa H, Johkoh T, Ichikado K, Taniguchi H, Kondoh Y, Fujimoto K, et al. Usual interstitial pneumonia and chronic idiopathic interstitial pneumonia: Analysis of CT appearance in 92 patients. Radiology 2006;241:258-66. 24. Kim EA, Lee KS, Johkoh T, Kim TS, Suh GY, Kwon OJ, et al. Interstitial lung diseases associated with collagen vascular diseases: Radiologic and histopathologic findings. Radiographics 2002;22 Spec No: S151-65. 25. Jawad H, Chung JH, Lynch DA, Newell JD Jr. Radiological approach to interstitial lung disease: A guide for the nonradiologist. Clin Chest Med 2012;33:11-26. 26. Welker L, Jörres RA, Costabel U, Magnussen H. Predictive value of BAL cell differentials in the diagnosis of interstitial lung diseases. Eur Respir J 2004;24:1000-6. 27. Veeraraghavan S, Latsi PI, Wells AU, Pantelidis P, Nicholson AG, Colby TV, et al. BAL findings in idiopathic nonspecific interstitial pneumonia and usual interstitial pneumonia. Eur Respir J 2003;22:239-44. 28. Lettieri CJ, Veerappan GR, Helman DL, Mulligan CR, Shorr AF. Outcomes and safety of surgical lung biopsy for interstitial lung disease. Chest 2005;127:1600-5. 29. Tiitto L, Heiskanen U, Bloigu R, Pääkkö P, Kinnula V, Kaarteenaho-Wiik R. Thoracoscopic lung biopsy is a safe procedure in diagnosing usual interstitial pneumonia. Chest 2005;128:2375-80. 30. Monaghan H, Wells AU, Colby TV, du Bois RM, Hansell DM, Nicholson AG. Prognostic implications of histologic patterns in multiple surgical lung biopsies from patients with idiopathic interstitial pneumonias. Chest 2004;125:522-6.